Facial hair can be camouflaged with a few careful makeup techniques. 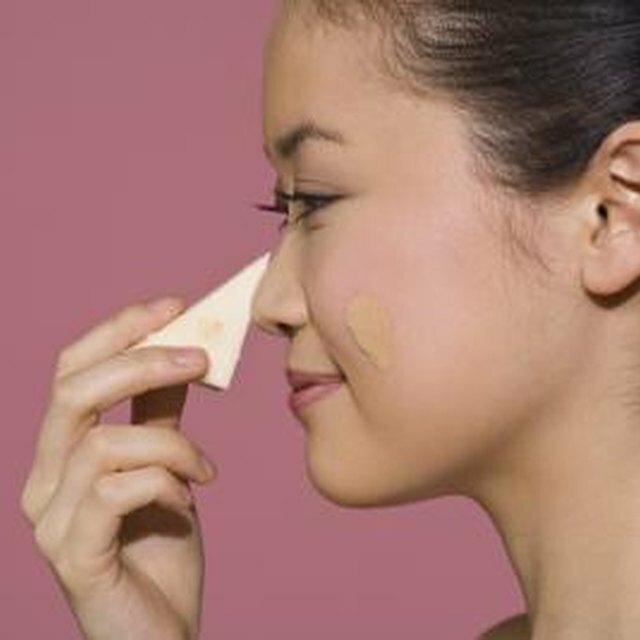 3 Do You Use Foundation or Concealer to Cover Up Pimples? Female facial hair is generally a subject people avoid. As with body fat and stretch marks, magazine images have often been airbrushed to wipe away any facial hair that may have existed on the subject of a photograph. In reality, facial hair -- whether just a subtle peach fuzz or more prominent hair on the upper lip and chin -- affects millions of women worldwide. The cost and discomfort that accompany many hair-removal techniques can make them prohibitive and unappealing. Fortunately, makeup can do more than cover up a blemish or two, it can also help blend in your lip hair without the added hassles of medical treatments. Apply a rich facial moisturizer to your entire face. Opt for a moisturizer that is appropriate for your skin type. Glowing, soft skin is always a good accessory and will help you blend the makeup more efficiently later on. Pump a pea-sized amount of face primer onto your fingertips. Sweep the primer over your entire face, focusing special attention on the skin above your upper lip. Apply the primer in the direction of the hair growth. This product creates a smooth, even surface for foundation to adhere to. Dip a small, stiff foundation brush into a full-coverage foundation that matches your skin tone as closely as possible. Brush the foundation onto the skin above the upper lip, working in the direction of the hair growth, generally in gentle downward strokes. Blend the foundation in until is sits smoothly. Apply a bit more foundation to this area of your face than usual to create sufficient coverage. Blend out the foundation towards your chin and jaw so that there is no makeup line. Apply a small amount of foundation to the rest of your face to even out your application. Dip a kabuki brush into a light, translucent setting powder and tap off the excess. Sweep the kabuki brush over your lip area to set the foundation. Keep the application very light to avoid a caked-on, dry look. Keep your skin hydrated and wash off makeup at the end of every day. Always work with moisturizing products to help create a soft, natural makeup look. Daily Mail: Zap That Facial Hair!